A FREE DAY PASS at selected clubs*. Just bring your Varsity Vibe coupon to reception. If you’re already a member, you can bring a buddy along for a free workout. If you join in April, you’ll get the rest of the month on Virgin Active. Want more? If you join by 30 April, and you’ll also get a FREE designer kit bag*. Simply visit your closest participating club, present your Varsity Vibe coupon at reception and we’ll take care of the rest. So find your enough with functional training classes, yoga, Pilates, Rumble…whatever you’re into. 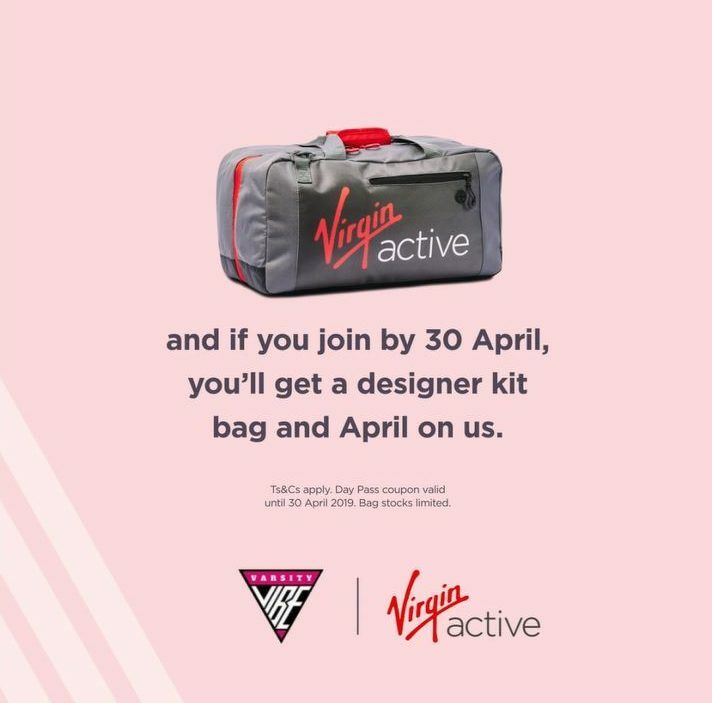 Plus, join by 30 April 2019 and get a FREE designer kit bag*. *Ts&Cs apply. Day Pass coupon valid until 30 April 2019. Bag stocks are limited. Excludes Collection Clubs. Want to get your active on? *Ts&Cs: Deal may not be used in conjunction with any other offer/promotion. Students must present a valid and completed “my profile” screen on the Varsity Vibe app (i.e. 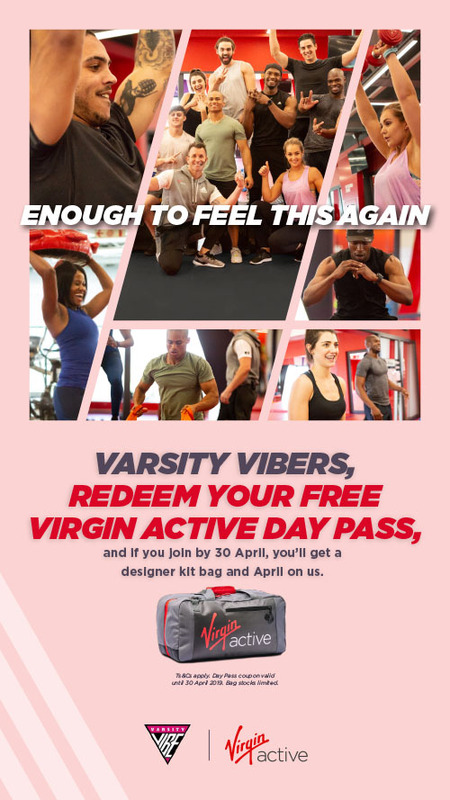 they have verified as well as paid for membership and have loaded their profile picture) AND present a valid, unused Virgin Active coupon on the Varsity Vibe App, to receive the deal/discount. Virgin Active reserves the right to refuse any Varsity Vibe “my profile” App screen that it deems to be invalid or fraudulent. All guests must abide by the club rules and full Ts&Cs (www.virginactive.co.za), bring a positive ID, complete the guest register and have a photo taken. Coupon cannot be redeemed for cash. Right of admission reserved. Deal valid until 30 April 2019.